My earliest movie memory isn’t of going to a movie theater, but of watching a movie at home. One night when I was about three years old, my mom and dad decided to rent a movie and order pizza for dinner and the movie they decided to rent was E.T. (1982). I remember asking my mom about the movie and she told me that I would like it. Boy, was she ever right! From then on, I was obsessed with E.T. I think a big part of its appeal to me, especially at that age, was the wonder of watching this alien creature. I remember liking Return of the Jedi (1983), particularly the scenes at Jabba’s Palace, for that same reason. Eventually, my dad decided it would be easier to just buy a copy of E.T. rather than to keep renting it because I wanted to watch it constantly. So one night he bought a tape of E.T. and while I was sleeping, he set it on the dresser next to my bed. When I woke up, the first thing I saw was that tape and I was ecstatic! I’ve lost count of how many times I’ve seen that movie, but it’s still my favorite movie of all time. As for how I got interested in classic films, I can’t remember ever not having some degree of awareness of them. Both of my parents like classic movies, so I remember watching things like Some Like it Hot (1959) and Arsenic and Old Lace (1944) when I was a kid because those are things my mom would watch. Casablanca (1942) is a big favorite of theirs. I don’t even remember the first time I saw Casablanca; it’s just one of those things I feel like has always been there to me. I also watched a lot of TV shows that were very film referential, like I Love Lucy, The Simpsons, The Critic, even Muppet Babies, and that’s how I learned about a lot of classic movies and movie stars. Once I got a bit older, I started gravitating more towards older movies out of my own interest. I went out to the movies with my friends all the time when I was in high school, but they always wanted to see the worst movies and I was craving something different. Movies with excessive CGI or Ben Stiller weren’t my style, but Niagara (1953) and Dr. Strangelove (1964) were. The big turning point for me was when I was in college and TCM was added to my dorm’s cable line-up. When we got that, I started watching TCM pretty often. One Saturday morning, I just happened to catch The Great Dictator (1940), and that was it for me. All of a sudden, I was fascinated with Chaplin and wanted to see some of his silent films. Before I knew it, I was a full-fledged classic film addict. Angela Petteys, 27, lives in Detroit, MI. She graduated from Ferris State University with a degree in Television and Digital Media Production. 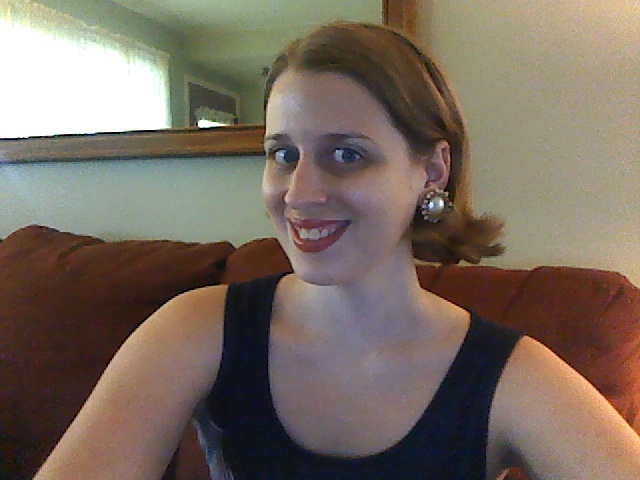 Angela blogs about classic film at The Hollywood Revue and is a contributing writer to The Cinementals. Thank you so much for sharing your memories with us, Angela! 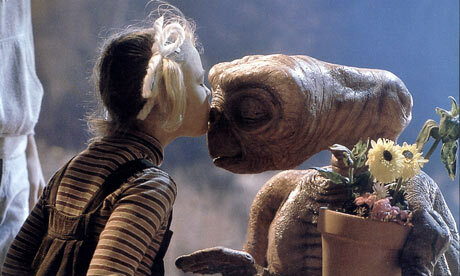 I think most people around our age (I’m a couple of years older than you) remember E.T. as a kind of vanguard moment. In fact, I’ve never met anyone who dislikes that movie (at least, no one who will admit to it!). My pleasure, thanks for inviting me to participate! I like the story of you receiving a VHS tape of E.T. What a great memory! Your parents had good taste in movies and the gene seems to have carried on through to you. I think that most of us started watching classic films because of our parents or we took a class in college and got hooked. My mother loved old movie and that’s where I got my first taste of Natalie Wood (my mom loved her, me not so much, but still). Thanks for sharing, Angela.